The gift shop at the Desert Botanical Garden is both fun and practical. There you can purchase desert plants for your home or yard, if you are a local resident, or gift plants suitable for shipping. Yes, you'll find the standard tee shirts, but there are lots of interesting books on gardening and flowers of the Southwest, food items, decorative items, and jewelry. The gifts are colorful, the gifts are fun, the gifts are useful, the gifts are whimsical. Shopping Tip: The attractions I mention here are some of my favorites, and are well worth a few hours to see what they have to offer. If your time is short, though, and you can't stay and peruse the exhibits, you may just visit the gift shop without paying the admission charge (if applicable). Just check in at the ticket booth and tell the staff that you just want to go to the gift shop. You might not ever think of going shopping at the airport. Why not? Phoenix Sky Harbor International Airport Terminals 3 and 4 in downtown Phoenix might just be the best spot to find a wide variety of southwestern gifts in one place. The gate level at Phoenix Sky Harbor's Terminal 3 may not be as big as at Terminal 4, or have as many amenities. It does have several unique stores where you can surely get an Arizona souvenir for everyone on your shopping list. The shops are on the public side of the security gates -- you don't have to have a boarding pass to get there. 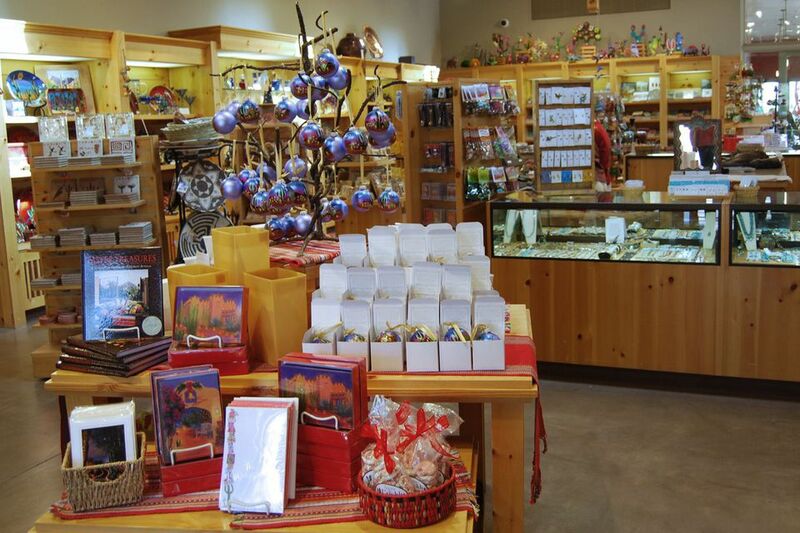 There is a great book store with many Southwestern cookbooks and other Arizona-related books for adults and children, a store with Native American art gifts, a shop devoted to Arizona souvenirs, one for Southwest resort wear, and place where you can purchase Arizona food items and gifts. Hot salsa! Terminal 4 is larger with more shops and restaurants. We're focusing on Arizona-themed shopping here, and at Terminal 4's public concourse (gate level) you'll find Southwestern foods, Native American arts, an Arizona team shop and an Arizona Highways store, along with other trendy gift shops. Yes, you have to pay to park at Phoenix Sky Harbor Airport. It really isn't a lot of money for short term parking. You can take the free Inter-Terminal Shuttle if you decide to hit both terminals while you are there. The T4 parking garage has spaces designated for short-term parking only, maximum 4 hours. If you have extra time, and you don't want to pay for parking you can use METRO light rail, coupled with the Sky Harbor Valley Metro Light Rail shuttle, to get to airport terminals. Of course, you still have to pay for METRO unless you find a free parking spot near the shuttle location. Rawhide Western Town is a place for old west fun—gunfights, stunt shows, shootin' gallery, gold panning, stagecoach rides, cookouts and such. As far as shopping is concerned, this is a great place to find that cowboy or cowgirl gift. There's a store for the little ones, but I also especially like the hat store with selections for all ages and genders. You could also bring the family, dress up in 1880's style (they provide the costumes) and have your photo taken. What a great gift idea! The Phoenix Zoo is a nationally acclaimed zoo, and the Desert Marketplace Gift Shop at the Phoenix Zoo has quite a variety of gift options. Yes, there are the small inexpensive gifts, toys and stuffed animals that you'd find at all zoos, but there are also great clothing items, home and garden gifts, and a full candy shop inside. The Heard Museum is a unique way to experience the culture and history of the Southwest, and they have a great gift shop, too. Browse the store and you'll be able to find books, DVDs, videos, children's items, folk art items, jewelry, Katsina Dolls. pottery and more. If you are looking for official merchandise for the Phoenix Suns, Arizona Diamondbacks, Arizona Coyotes, and Arizona Cardinals, or you want to buy tickets without paying some of those Ticketmaster fees, the Arizona Team Shops are for you. They also carry merchandise for the University of Arizona Wildcats and the Arizona State University Sun Devils. All of our stadiums also have team specific shops that are open to the public. They have business hours during the week and can be accessed from the outside of the stadium just like any other store. However, the exterior entrance may be closed a couple of hours before games, in which case you'd need a ticket to get in to shop. Handcrafted jewelry, books, posters, cards, apparel and handbags, Soleri bells, children's toys and activity sets, Museum exhibition-related items and more are available in the Museum Store at Phoenix Art Museum. If you are shopping for the person—man, woman or child—who has everything, Phoenix Art Museum may be your best bet. Taliesin West is the name of the Frank Lloyd Wright Arizona home and School of Architecture in Scottsdale, Arizona. The Taliesin West Bookstore and Gift Shop carries over 1,000 Frank Lloyd Wright books and prints, as well as gift items. All proceeds from the sale of items at the store help support the Frank Lloyd Wright Foundation. The gift shop at the Mesa Arts Center was converted to an Artists Cooperative Gallery in 2011. Building on a greater connection with the local community, the store is staffed by the local artists who produce the works, including artisan glass and tapestry, paintings and sculptures. While you are shopping for a gift or for yourself, you might meet a local artist during a scheduled in-store artist demonstration. Check the schedule and hours before you go. The gift shop at the Arizona State Capitol Museum has items with Arizona flags, state symbols, gifts relating to the USS Arizona, jewelry, clothing, decorative items, office gifts, toys, puzzles and books. It is open during regular museum hours. Don't let the online order form fool you -- there are many more items in the store than are offered online. There is free parking nearby. While most of the gift shops listed here are associated with museums or local attractions, there is a shop in Downtown Chandler where you can find edibles, books, beauty products, home decor, glassware, toys, ceramics, soft goods and more, all made in Arizona. You might find a scorpion paperweight here (people actually ask for those), but there are few items in this store that would fit in the tacky souvenir category. You don't have to spend a fortune here to make your gift recipient feel our Arizona warmth. When I'm in the neighborhood, I often stop in and buy a few gifts that I know I'll need during the year for birthdays or at holiday time. Sibley's West support local artists and businesses, and you can take advantage of artist appearances, wine tastings and other events held at the shop. Two types of people will want to shop here. First people who are visiting Scottsdale and suddenly realize that they didn't purchase any gifts for the family back home. Second, locals who want to send a gift back east or north that reminds them of Arizona. Anyone who appreciates the Old West -- art lovers, movie lovers or even little cowpokes -- will enjoy gifts from this museum gift shop. While you will find reasonably priced items here like salt and pepper shakers, coffee mugs, books and toys, most of the items are not in the tacky souvenir category. Western Spirit: Scottsdale's Museum of the West is open every day except Monday, check online first about major holidays. No admission charge is required if you are only shopping.